The previous post was focussed on the woodworking aspect of the motorized T.V. 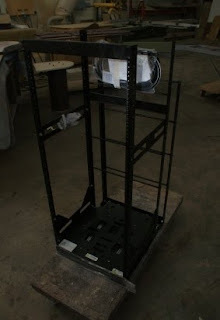 cabinet we're making for JLT's office. Today's post will showcase some of the cool hardware and technology that's also being integrated into this project. 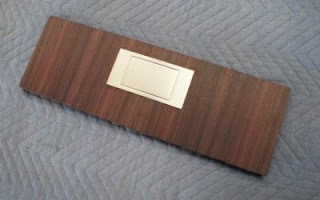 This is the keyboard tray that will be mounted to the underside of the desk. 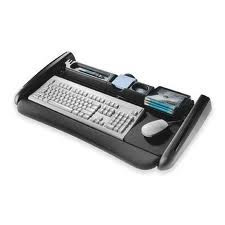 Made by Accuride, this unit has integrated wire management and holds a keyboard and mouse, along with added storage for pens, pencils, and DVDs. 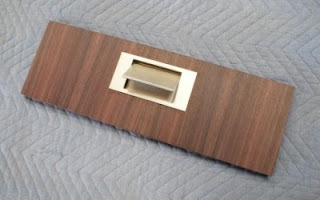 This satin nickel pull will be the focal point of the Scotch Bar. Since wood is the predominant material being used on the custom furniture we are making, it felt prudent to introduce other materials and textures as well. 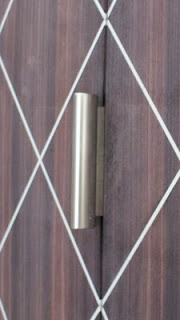 JLT liked the idea of using simple, yet substantial, metal pulls for opening the drawers and doors. After tremendous research and experimentation we finally found the perfect balance with these satin nickel pulls, designed by Adam Laws of Australia. The photo above shows the custom pull-out/rotating mechanism that will be the heart and soul of all the electronics going into JLT's office. In addition to the audio and video components, this rack mount system will also house all of the lighting controls as well as a state-of-the-art Savant home automation system. What is a Savant system? Let's just say that if James Bond had an office, he would be getting "Q" to trick it out with a Savant. This video will explain it better.